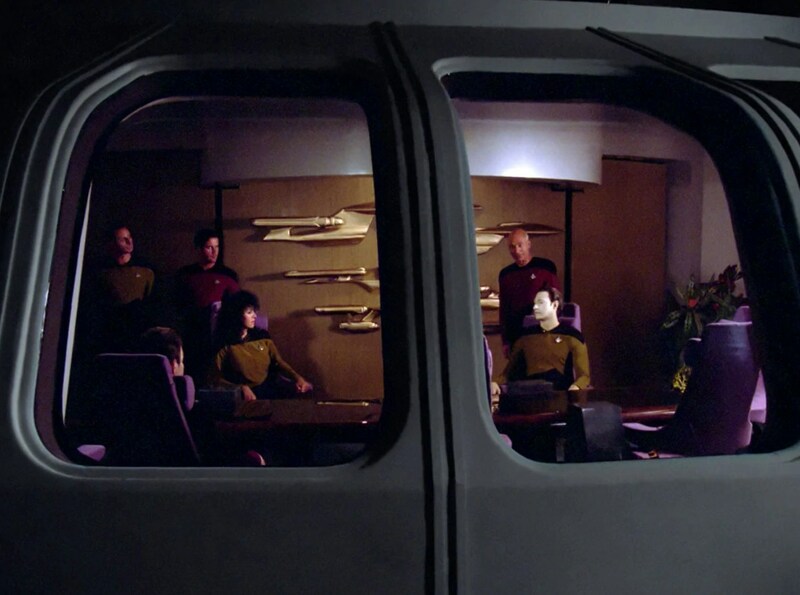 I though the Excelsior was always going to be used for the Ent-B given it was on the back wall of the Confrance Room on the Ent-D, along with the other ships to bare the name Enterprise. Even so, I always wondered where the idea came from for those add-on on the secondary hull. Now that you have told us, I can see the plane in the ship and vise vursa. The conference room back wall changed a little each season. But I found a pic of all the Ent models on the back wall in the middle. Going by the hair of the woman sitting on the left handside it has to be one of the early season. As you can see under the Gal model is the rear end of the Excelsior. I guess even though they done this in the serise, if the PTB had the budget they would gone with a new model and ignored those models. Hey John – its great seeing how you inspiration flows in to a new design. I’ve always thought that the Catalina was a beautiful plan and it’s really cool to see how you incorporated design elements from it in to the E-B. Thanks for posting! Again with the classics! Very nice. As much as I love the faster and sexier p-51s, Spits, and Mossies the ol cat is also a fave. When I was a wee lad my dad built and absolutely gorgeous 1/48 scale model of the cat and I used to gaze on that thing all the time. I was thrilled to see alot of cat action in the film Always with Richard Dreyfus and John Goodman using the cat as a water bomber to put out forest fires. oh, and the E-B drawing is cool too! “Always” is defiantly the PBY’s best film,,,, huge models were built at ILM in whole and sections,,,, What happened to your dads model,, did you manage to save it??? that is the coolest plane ever!!!! There used to be one parked at the Van Nuys airport in CA for about a year,,, looked like the one used in the 1990-91 film “Always”, but could never get on the tarmac to see it up close. Speaking, of which, I was meaning to ask you, how do you stand on the use of pictures on your blog…I’ve become somewhat of the resident expert on the subject in writing about the studio models (for which your blog has been invaluable) and some of the sections and articles would benefit from picture additions (fully credited of course, MA is quite strict on that), especially the ones from the last 3 seasons of ENT (there is virtually nothing of that in print)…. AWESOME article on the ship Robert!!!! what a way with words and facts you have there!!! Give me ago anytime about using stuff from here through my email. I have to say, the Enterprise-A is my Fav, but the Enterprise-B right there too. I felt that everything came together. The Bridge, the graphics and the ship felt like the final result of the evolution of the ships and graphics from that era. I am not sure what it is, but the way the model was filmed, it felt like a real ship with mass. The ship leaving drydock with the music and the light reflecting off the hull is one of my favorite shots, that and the shots with the front tilting up before it was hit by the nexus and the last shot of of the crew looking into space. I wish that part of the movie was longer and we got to see more of the ship. Thanks for the post! OhI think that 3D sketch would more a cool readyroom painting. Thanks again! Flying boats and amphibs have been my favorite aircraft since I put together a Short Sunderland kit back in the 60’s. This confirms my hunch that the strakes on the hull were inspired by a flying boat. I really like it. That part of the film could have been longer, the B had a good solid feel to it. Cool the excelsior is one of my favorites. Cant wait to see more. I really like to learn the inspirations behind design work, especially when it’s something from aviation I already found inspiring myself. One thing that’s always interested me about Enterprise-B is her unusual color scheme for a Federation starship. More green in the blue for the trim…any particular knowledge of or commentary on that or where it came from? I’ve not seen that type of plane before, so thanks for introducing me to it. Very unusual and I can see the similarities with the B straight away. It doesn’t seem like there’s that kind of creativity in aerospace anymore, but I guess they’ve figured out enough about how a plane needs to be designed that there’s not much call for weird and wonderful experimental configurations anymore (aside from planes like the V-22 Osprey and a few others). Always loved the changes to the Excelsior that helped distinguish the Enterprise-B from the Excelsior! I thought that it gave the ship a nice flavor, if you will. Always love learning what your source of inspiration was when you draw these things! 😀 Love the lines and those impulse engines on the back of the saucer! They just scream power! Specifically about which part of the Nacelles is supposed to glow blue! for example the AMT/ERTL model and now i also see it in your Artwork. Years later in DS9 on the CGI model the black center piece did glow blue, instead of the top piece. Do you have any background infos to share on that? Is one correct and the other wrong (did the DS9 guys screw it up?!)? Is it supposed to be one way on the Excelsior and the other on the Enterprise-B? blue glowing center piece or no glow at all, and both original and refit versions. and it looked like the damage would’ve been on an area of the original hull anyway. Can you address that? I’m still confused. I assume that the ‘section of decks’ refers to the flanges that stick out around the deflector dish. If they were intended to be the damaged section, why sketch the damaged section above them and leave them untouched? If the hull above and around them is also part of the addition that was capped onto the original model (as it appears to be in one of the photos), were the flanges themselves never meant to be the damaged area? Also, the article makes it sound like ‘the producers originally wanted a new design’ meant a whole new class of ship, despite continuity. If they’d had the time and money, would they really have come up with a whole new design and in effect said “We’re not going to be limited by what’s been shown on the back wall of the 1701-D observation lounge”? I had the feeling you had inspriation from the PBY, just love how inspriation comes from the past like that. BTW, STO’s adding the D-4 to the roster. But instead of retro, its going to be a “K’T’inga Refit”. I always love your stuff, John, but the whole Ent-B thing was lipstick on a pig to me. To be honest I found the Enterprise B design to be less then ideal. I actually don’t mind the secondary hull extension of the Enterprise B that was inspired by the PBY Catalina. Yet the other changes I found questionable, especially the new set of engines on the saucer section. To me they look tacked on and don’t make much sense. Overall the design seemed to interrupt Bill George’s elegant design. Still I understand the production had little funding left for the E-B’s model design and had to make due but at the same time . . . well Don said it best above. Here’s a rather novel take by a fan on the Enterprise B had the budgetary problems not existed – http://goodstavo2.blogspot.com/. The Catalina PBY is pretty much my favorite airplane.